I have used fountain pens for well over a decade now, and for a long time I stuck with newer pens which could use cartridges. For a new pen user who is getting accustomed to using a fountain pen, I think cartridges are a terrific thing. However, cartridges are expensive and not always easily available; they are often susceptible to evaporation, making for a thick, pen-clogging sludge; the color selection is limited; and they significantly offset one of my favorite things about using fountain pens: the elimination of disposable waste, as I mentioned on the home page. In switching to using bottled inks full-time, I have not only discovered the calming simplicity of filling a pen from a bottle, but I have opened a whole world of rich and seductive colors. 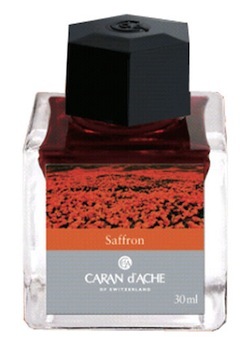 Bottled inks not only provide a vast array of colors, but subtle nuances in color – this red has an orange cast, that a pink tone. This one shades to deep ruby, that one shades to a rusty brown. Some inks work better in certain pens, and give different results, almost seeming to be an altogether different color. The possibilities are endless, and open whole new ways of appreciating the individual characteristics of each writing instrument. I think it is with bottled inks that any pen, whether a modern converter-filler or a vintage lever-filler, expresses its true personality. There is also a wide array of bottles, and sometimes, the gleaming glass bottles are treasures in themselves. Caran d’Ache’s admittedly impractical inkwell is nevertheless gorgrous, especially when full of some of their vivid jewel-like colors. The legendary Visconti champagne-glass style bottles are rapidly becoming much sought after treasures. 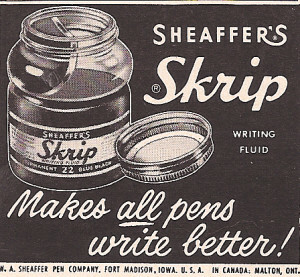 Some, like Mont Blanc or vintage Skrip ink bottles, are collected for holding other inks because of their clever designs which make filling pens easier. And besides, inks, while not inexpensive, are still far less costly to collect than pens, giving the pen-addict a less budget breaking alternative to keep us going between pen purchases! The ink list pages catalog the inks I currently own, with scanned swatches. There are some lovely ones, and there are some truly stunning ones.